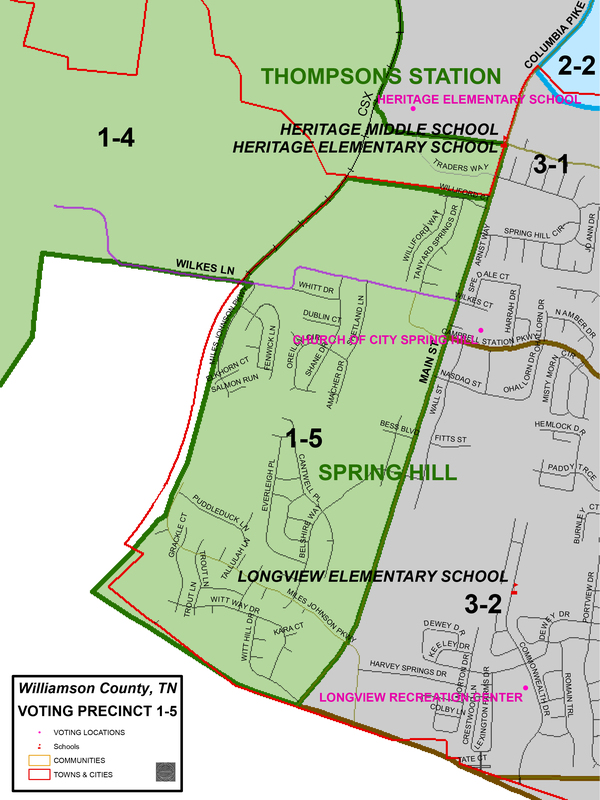 The Williamson County Election Commission recently announced the creation of a new voting precinct to accommodate continued growth in the City of Spring Hill. Voters who reside west of Main Street in the subdivisions of Autumn Ridge, Belshire, Shannon Glen, Tanyard Springs and Witt Hill, and along Wilkes Lane in the First County District, will now be voting at Precinct 1-5: The Church of the City's Spring Hill Campus, at 4910 Main Street, near Campbell Station Parkway. Voters in this area previously voted at the Burwood Community Center on Carters Creek Pike. Voters residing in these areas will be mailed new voter registration cards no later than Oct. 31, 2015. This new voting location will be open and used beginning March 1, 2016, in Tennessee’s Presidential Preference Primary / Williamson County Republican Primary Election.